This is one of my favorites, and it is so easy to make. After years of buying clams that were already stuffed, the ones that were mostly bread I decided to try my own. The ingredients are pretty simple and most are found in your home. 3 large Quahog clams, washed and free of sand...1/4 onion minced...1 clove garlic minced...2 small Italian sausage links, casing removed...2 tablespoons of chopped fresh parsley...1/4 cup of diced celery... 5 shelled and chopped pistachio nuts...about 3/4 sleeve of Ritz crackers crushed...a sprinkle of dried oregano...some red pepper flakes to your liking, I like a lot...and olive oil, enough to fry the sausage. Place clams in pot with water, cover and steam until clams open. When opened remove clams and set aside to cool,SAVE LIQUID. In a fry pan fry the sausage until nicely browned, let cool. Prepare all the other ingredients and place in mixing bowl. Take the cooled clams and chop them semi-fine and place them in bowl. Chop cooked sausage about the same size as clams and add to bowl. Take reserved clam broth and add to mixture a little at a time so as not to overly wet the crackers, you want the stuffing to be moist but not overly soaked. Fill clam shells, and place them in refrigerator and let them cool for an hour or so to allow them to set. Preheat oven to 350, place clams on baking sheet and bake for 15 to 20 minutes or so. Before baking you can garnish with paprika. You can also drizzle the clams with EV olive oil. Finished dish. As a rule one clam, which makes two stuffed clams is a nice serving portion. Time spent walking this path was as enjoyable as hooking a sea-run brook trout. The mornings were especially beautiful, the nights dampness creating those wonderful smells found only in nature. The birds seem more vocal and the wildlife can be quite close to you, sometimes to close as Jeanette found out. While walking she came very close to a bobcat. She was about 12 feet away and face to face when the cat bolted. When left alone nature can rebound in some of the most beautiful ways. The flora is strikingly beautiful. Small blooms can stand out like stars on a clear dark night. Spring is truly here at Lyman Reserve. The whole of Red Brook is beautiful, but this spot was a stand out. There were so many variations of water in this small run-pool. The currents caused a very deep hole on both the front and back of the log jam. An eddy developed briefly behind the jam before breaking into a swift smooth run. This is where many of my hookups took place. 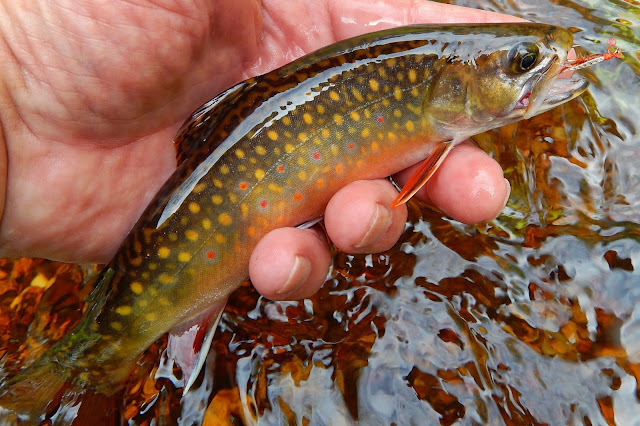 A wild brook trout, with some of the most pronounced colors seen in a spring brook trout. He was perfectly shaped and fought with such vigor. The little glass 3wt had all it could handle with this fish. Can anything be better in this life than to be fishing in such a place in the early morning? Maybe but not many. These brook trout are accustomed to seeing many types of small baitfish, and will readily take a streamer. Mallard wing as well as marabou streamers worked very well here. Lunch, not homemade but still very satisfying. in the stream. This little guy was hovering over a log. Born perhaps several week ago and showing his brook trout markings. Without a doubt, "a bad hair day"...one of the better streamers of the day. Remembering those who gave all. Jeanette and I just returned from a few days on Cape Cod. They were spent in part on the shores of Red Brook and the shores of Buttermilk Bay. The weather was beautiful with sunny skies and cool to mild temps. The winter had taken a toll there as it did most of the northeast and the folks there were glad it was gone. A side note it seemed as if everything was a week or two behind normal, maybe the result of the harsh winter. The stream was in fantastic shape. Most times that we were fishing there we had caught the tide right which made for more pleasurable fishing. As you can see in the photos the green-up had not been completed. The leaves were not fully shaped and the watercress was still some time away from full bloom. The river herring run was in swing when we got there and fish were in the brook heavy. With that I knew that fishing tidewater would be very difficult because when the herring run the stripers are right behind them. And stripers do not see them and brook trout as anything different then food. So thought was to fish further upstream and stand a better chance at taking the salters. Red Brook, an easier time to angle. Herring. I don't know if they actively feed while spawning but I did tangle with many of them. They are swift and formidable opponents on a glass 3wt. jumping and running like salmon. With the sun so bight and the stream so clear it was going to be a challenge to get a brook trout to take. I did manage to put the fly just where it had to be. Most places of cover and deeper water produced a strike. And in some cases the strike produced a salter to hand. These fish strike hard at streamers. There are lots of little fish for them to eat and eat them they do. When they did restoration work on Red Brook they knew exactly where to place structure. A fly near this structure usually means fish will take it. A healthy Red Brook salter. .....and the thrashing of a feisty wild brook trout. And then there's lunch..................part 2 coming. The Rangeley Sesquicentennial streamer fly is one of the most beautiful streamers I've ever seen. The streamer was tied by a tyer from Rangeley Maine. He gos by the name Gray Wolf. The streamer was tied to commemorate the 150th year of Rangeley Maine. As you can see from the cover of Fly Tyer magazine the year was 2005. I managed to purchase one of these streamers and have admired it for these many years. I will be away for a few days. I'll be fishing the Cape Cod streams in hopes of taking a few salter brook trout. A week or so ago we took a ride up U.S. Route 44 to the Connecticut border town of Canaan. This is an area I know a little about for I have fished a few streams in the area. But today this was a day to focus on some old family doings. The diner you see is the Collin's Diner. It has been in operation since 1940 and is still in the same location. As a kid I can remember going to the Great Barrington Fair every fall with my parents and the Collin's Diner was on the way. We would stop for breakfast on the way up, and when we left the fair around 8 or 9 PM we would stop for coffee on the way home. My friends that was back in the 50's. Well we stopped in the Collin's Diner this day in May of 2015 and the place is as I remembered it in those early years. The interior of the diner is original 1940. Of course the stool covers and booth covers have been replaced as well as a few other things but it's pretty much the same. The waitress was friendly and the owner/cook also is quite friendly. He told me the diner has been in his family since 1970. The menu was typical diner fare and the prices were seemingly from the 70's. As you can see the diner is not large, everything has a purpose and it's functional. Local patrons still enjoy coffee and the daily news, in the form of an actual printed paper. The cook still does is stuff on a heavy steel grill. The diner is very clean. The stainless steel shines as does the glass. The breakfast we were served is just as we ordered. The only surprise was the prices. All of the above, which included the bottomless cup of coffee, which was very good. The total for us both is $7.29. Leaving the diner we headed up U.S. route 7 to the Massachusetts town of Stockbridge. A typical New England town with lots of history. I know some of you don't want to believe it but this is the place made famous by Arlo Guthrie back about 1965. "Alice's Restaurant". It is still in business and operates under a different name. It's in a little alley, and just a half a mile from the railroad track. This will be my second post about my recent trip to Franklin Land Trust conserved property in north west MA. While fishing this remarkable area I've come to the realization that it's people that can most affect the brook trout, both bad and in the case of FLT the very best. Myself as an angler look at a stream somewhat differently then a hiker, or one who loves to view birds, or the gentile soul who just wants to see the peaceful side of the natural world. As an angler and fly fisher I can and take all of the above. This is only gained within the areas of the small stream. Rugged and perfectly tuned environment. Pure water is key and the forest can make this possible. Cold confines, a wild brook trout calls this home. And the angler need only the simplest of tools to bring this jewel to hand. When I saw this stone lying in the stream I knew that all would be O.K. As Josh and I hiked back to the car I noticed this bleached out building. The sun was shinning off of it and it looked like a beacon in the wilderness. Josh informed me that it was used as a sugar house, this where maple syrup that fine condiment so highly favored by New Englanders was made. He commented that it would be nice to restore it and use it as a hut for tired anglers and hunters to use as a resting and reflecting spot. Very fitting I believe. This is the third stream we fished that day. The name of the stream is Mill Brook. This stream is probably the easiest stream to navigate and has a very willing group of brook trout in its waters. We fished along its shores until the day was coming close to an end. Mill Brook, brook trout have a passion for dry flies. This gorge was the last place we would fish. Our day was at end, but the work of saving places such as these is and must continue. Is he worth saving? I think you have the right answer.